"Ang success namin is that we're still around, kasi na-sustain namin. Kailangan nasu-sustain, and the quality of the program is maintained," says Cinemanila festival director Tikoy Aguiluz. Festival director Amable "Tikoy" Aguiluz VI—better known in the local film circles as Tikoy Aguiluz or Direk Tikoy—is happy with the turnout of this year's 12th Cinemanila International Film Festival (CIFF). "Happy ako kasi maganda yung program, e. Sa umpisa, may problema, Nag-pick up naman kaagad. Maganda ang lineup!" Direk Tikoy enthused when interviewed by PEP (Philippine Entertainment Portal) after the screening of the CIFF's closing film, Amigo, at Cinema 1 of Robinson's Movieworld Galleria, in Ortigas, Quezon City, last Sunday, December 5. Amigo, a big-budget turn-of-the-century war drama set during the American occupation of the Philippines, stars award-winning Filipino actor Joel Torre, and is directed by Hollywood independent filmmaker John Sayles, who also wrote and edited the film. Joel and his director graced the ceremonies, although Sayles had to leave earlier before the end of the screening. Direk Tikoy and the other stars and foreign guests remained until close to midnight. Among the star-attendees were siblings Mark and Cherie Gil, with her daughter; indie filmmakers Kidlat Tahimik, Keith Sicat, Sari Raissa Lluch Dalena, Kiri Dalena, Adolf Alix, Jim Libiran; character actor Spanky Manikan and wife Susan Africa. Direk Tikoy's daughter, Anima Aguiluz, was also present with the Cinemanila staff and some guest-representatives from local and foreign media. FILIPINO EXPERIENCE. PEP noted that this year, Cinemanila Filmfest opened and closed with films about the Filipino experience as written and directed by foreign filmmakers. "Yes, yun nga ang maganda," remarked Direk Tikoy. "Last year, mga Filipino directors na world-class ang films naman." The opening film, Pinoy Sunday (screened on December 1), was directed by Taiwanese filmmaker Wi Ding Ho and starred comedians Epi Quizon and Bayani Agbayani. It tells the extraordinary exploits of two OFW's based in Taiwan upon seeing an abandoned sofa which they take home, with wacky consequences. Amigo, on the other hand, tackles Filipino martyrdom in the hands of the cruel American colonizers. Aside from Joel Torre, the huge Pinoy cast is composed of Rio Locsin, Ronnie Lazaro, Ping Medina, Spanky Manikan, Joe Gruta, and John Arcilla. Direk Tikoy is happy about the direction of Filipino films, especially the indies, which has greatly benefited Pinoy artists. "Gano'n na talaga yung mga Filipino talent, global na, world class na!" he exclaimed. Comedian Epi Quizon topbilled a Taiwanese-directed Pinoy film. His actor-father, ace comedian Dolphy, himself a supporter of the local indies, received the Lifetime Achievement honor of the 12th Cinemanila International Film Festival. SUPPORT FROM FDCP. Direk Tikoy doesn't regret that they have no local government support. "Wala kaming local government support, we only have [support] from the FDCP [Film Development Council of the Philippines] and friends," he said. Though the FDCP, now headed by former actor-director Briccio Santos, is a government-funded agency for promoting Filipino films, the support from the local city government was missing in this year's CIFF. 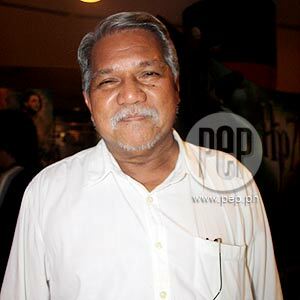 But Tikoy is hopeful, as he said the Cinemanila still needs such backing. "Maybe next year. May problema sa Manila, e," he said. GOOD SIGNS. Can't the Cinemanila International Filmfest, after more than a decade, stand on its own? "That's the objective," said Tikoy. "But, no, kailangan din ang support from private sectors and the government. It cannot stand on its own. "Dapat, private at government, hindi lang puro government. "Pero this is the year that, with the MTRCB [Movie and Television Review and Classification Board], we didn't have a problem," Direk Tikoy also noted, giving due credit to the review/classification board, under its current chair, Mary Grace Poe Llamanzares. "Walang problem...full support [ang MTRCB]. Malaking bagay 'yon! "And the Film Development Council also supported us. And that's a good sign na may kinabukasan [ang Cinemanila]." INDIE SYSTEM. Under the new administration of President Noynoy Aquino, Cinemanila filmfest may not have gained local city government support, but Direk Tikoy is proud they were able to pull it off with quite excellent and world-class films on its lineup. "I mean, c'mon, maski na austere 'yan, yung programa namin, hindi nawala. Walang compromise. Walang compromise sa standard." Tikoy is referring to the ceremonies and receptions with this year's festival officially held for only five days (December 1-5), and three-day extended screenings (December 6-8), at the Robinson's Galleria cinemas. "Pupulaan mo yung maliliit [na aspects], pero yung program, hindi mo puwedeng pulaan," stressed Tikoy. "Malaki talaga ang cost to launch a festival like this. Malaki talaga! "Yung sa cost, 80 percent of it, napupunta sa rent [for the venues]. "But we try to be flexible, and pag walang budget, we work it out. "Ang philosophy namin, parang gumagawa ka ng indie films. "Pag may budget, okey lang. And pag walang budget, gagawa ka ng paraan. And importante, magawa mo. "Last year, we have a big event...bongga 'yon! But, ang sa akin, ang importante, yung program. "The films are our stars!" It speaks so much about the 12-year-old Manila-based international film festival which Direk Tikoy considers a success. "Ang success namin is that we're still around, kasi na-sustain namin. Kailangan nasu-sustain, and the quality of the program is maintained," he said in parting.